The New York Times reports on El Alto -- the leftist free market bastion that, since it seceded from La Paz in 1988, has grown bigger than the capital city. Residents describe El Alto as a nonstop city financed by immigrant dreams of a better life. Beyond the market, there are thousands of small businesses, including importers, manufacturers and garment shops that make knockoff brand-label clothing. The city seems to be in a constant state of construction, fueled by the commerce and, locals said, by money from Bolivia’s drug trade. And there are language academies that give courses in Chinese for El Alto entrepreneurs. The most prominent feature of El Alto is its vast open-air market, which fills mile upon mile of city streets every Sunday and Thursday. Here vendors by the thousands offer a huge array of goods: piles of used T-shirts and other clothing that arrive in bales from the United States; cars, new or used (and sometimes stolen); neatly arranged arms, legs and heads from broken Barbie dolls; electric guitars; mummified baby llamas; pickax handles; and myriad other items. Each week, millions of dollars pour through the market, which operates in an almost total vacuum of government intervention, taxes or regulations. 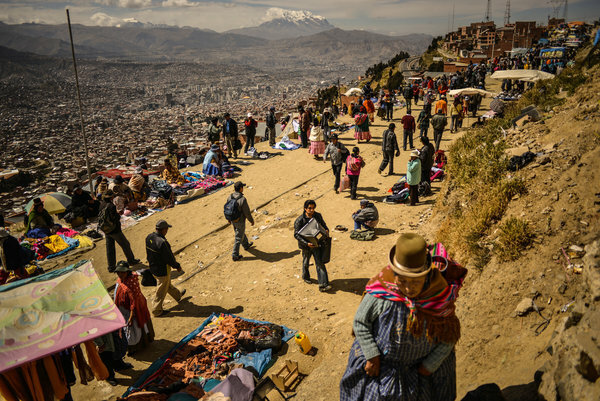 "El Alto can be Hong Kong in the middle of the altiplano, or it can be a slum," a local activist told the paper. "You’re in the exact point where you need to establish the foundations for the city’s development." So will the System D city go formal? And, if so, what will that do to it's entrepreneurial spirit?